Badminton World Federation has received a TAFISA Sustainability Award for its development programme, Shuttle Time. TAFISA President, Professor Ju-Ho Chang, and TAFISA Secretary General Wolfgang Baumann presented the award to BWF Development Manager John Shearer at TAFISA’s gala dinner in Budapest, Hungary. Shearer (above) represented badminton’s world-governing body and showcased the Shuttle Time Schools Badminton Programme in one of the parallel sessions. 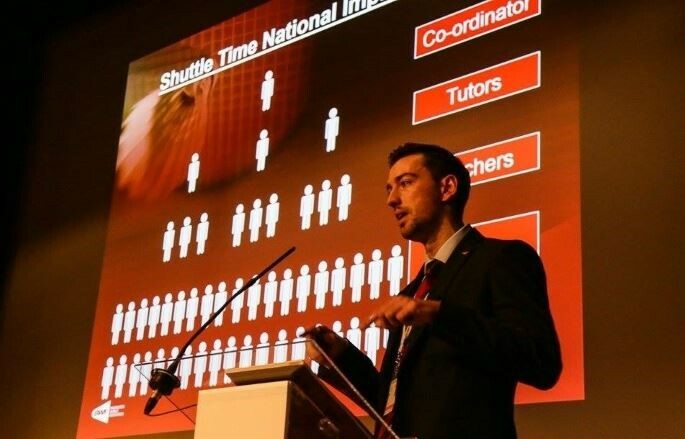 He provided an overview of Shuttle Time, BWF’s development principles, how the programme is delivered globally through BWF’s continental confederations, member associations and various partners, and how Shuttle Time is evolving the sport-for-all concept. Shuttle Time was officially launched in 2012 and has progressed rapidly. The schools-based, grassroots initiative has reached 94 implementations so far and is vital to achieving BWF’s vision of making badminton “the most played school sport in primary and secondary schools worldwide”.